This crispy sweet potato is next level delish. We think it’s the perfect healthy side dish to serve at your next lunch or dinner. It could even be a winning recipe for Christmas day! Yes, we are already talking about Christmas… becuase it’s Christmas in about a month. What the?! Where did that 12 months just go? We mostly have Christmas sweet treat recipes on the blog and the app but we do have an epic Christmas stuffing recipe here. And we’re planning on sharing a glazed ham recipe too. Go us! The thinner the sweet potato, the crispier it’s gonna get. And we vote crispy sweet potato bake wins! If you don’t have a mandolin (like us, coz Emma once nearly sliced her hand off* and now we banned them) make sure your knife is super sharp so you can cut the sweet potato nice and thin. This recipe is a great base, super simple and super delish but feel free to add extra stuff. Like cheese, cheese is always a good idea. So is bacon. 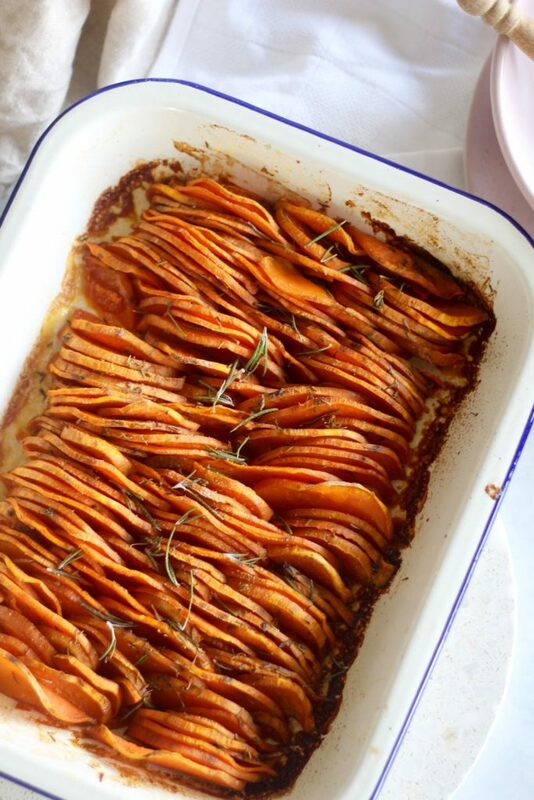 If you make this crispy sweet potato bake, share a pic with us on social media! Oh, and if you make it on Christmas day make sure you share a pic of your merry buffet. Yum. Cut the sweet potatoes in half lengthways, so they have a flat side. Then cut them super dooper thin so they look like semi circles. You can use a mandolin if you have one. Place the cut up sweet potato into a large bowl, add the melted butter, thyme, salt and pepper and stir until the sweet potato is coated in butter. 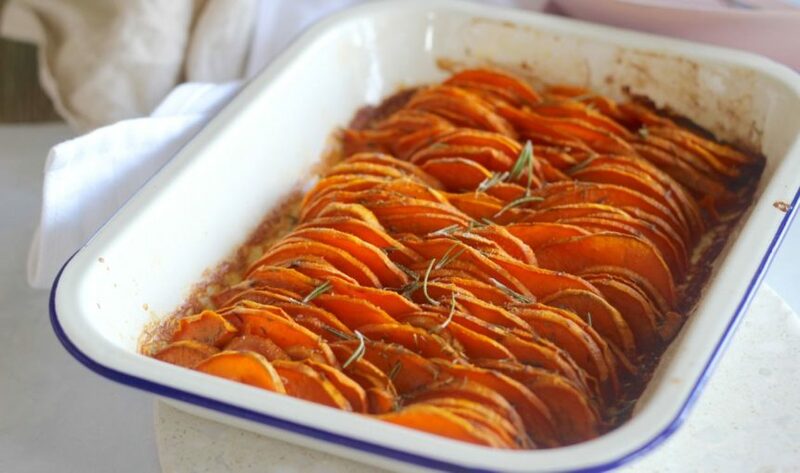 Grab a large baking dish, place the sweet potato pieces flat side down and upright into the dish. Make them over lap and look cool. It's food art! Place into the oven for 1 hour and 15 minutes. Keep an eye on them so you don't burn anything. Serve right away. They'll be a mix of crispy delish and soft buttery delish. Half way through top with grated cheese for extra delish factor. Drooooool!